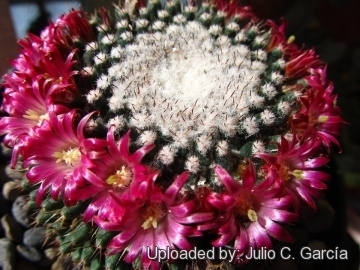 Mammillaria casoi (mystax), Cuacnopalan, Puebla. Spines are of variable shape and length, occasionally they are very long (up to 7 cm long) and twisted. Origin and Habitat: Mammillaria mystax occours widespread in highlands of southern central Mexico, centering in Puebla and adjacent Guerrero and Oaxaca. Altitude range: 1,000 to 2,600 metres above sea level. Type locality: Mexico. According to Hemsley, Karwinsky's plant, which is the type, came from Ixmiquilpan and San Pedro Nolasco at about 200 m altitude. Habitat and Ecology: The species occurs in tropical dry deciduous forest (Vovides et al. 1997), Quercus forest and xerophyllous scrubs together with several other cactus species such as: Mammillaria conspicua, Mammillaria pectinifera, Mammillaria sphacelata, Mammillaria viperina, Coryphantha pallida, Echinocactus grandis, Ferocactus recurvus and Agave echinoides. This species is common and abundant within its limited range. There are no major threats. However, it is affected indirectly from land use change for farming and cattle ranching. 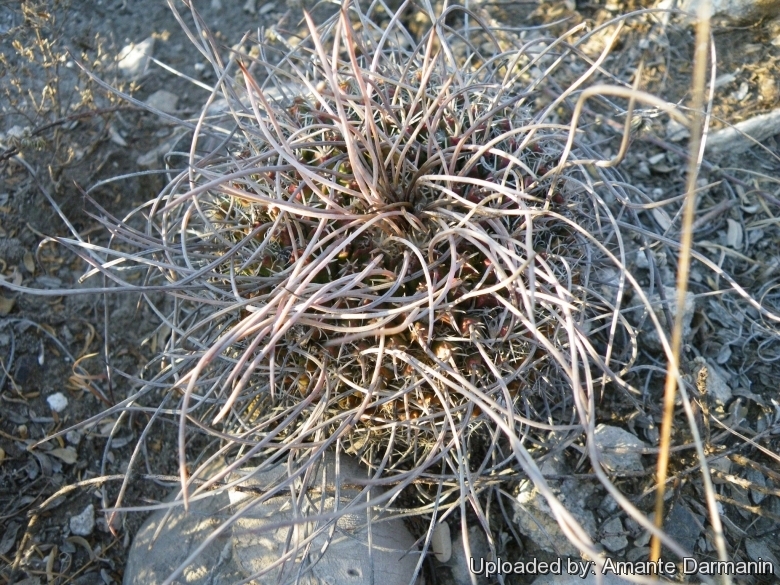 Mammillaria erythra f. ruber Repp., n.n. 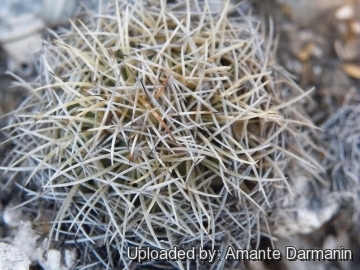 Description: Mammillaria mystax is a single stemmed cactus with neat pyramid-shape tubercles and with age can offset to form loose clumps. In its wild state its crown is entirely covered with long entangled, erect, central spines which overtop the plan. The species is common in cultivation and produces a profusion of rose coloured flowers in a ring around the crown of the stem. Spines are of variable shape and length, occasionally they are very long (up to 7 cm long). Stem: Globose to short-cylindric, 7 to 15 cm. high, 7-10 cm in diameter, flat-topped dark grey-green, eventually dividing dichotomically. Tubercles: In as many as 34 rows, prominent, thickly set, firm, pyramidal, four- to six-angled, sharply keeled, 1-1,5 cm long, 8 mm broad, full of milk which freely flows when pricked or cut, axils with wool and bristles. Radial spines: 3 to 10, small, spreading, white often with darker tips, 4-8 mm long. Central spines: Stout, twisted, interwoven, purplish with dark brown tips, later grey, variable in number usually (3-)4, sometimes one, of which (2-)3 about twice as long as the radial ones, the other more centrally placed much elongated, 2 to 7 cm long (in cultivation this elongated spine does not always occur). Flowers: Rose purple with brownish midveins, 10-25 mm long and in diameter appearing in 2 or 3 rows, very abundant. Inner perianth-segments dark red, 12 mm long. Stigma-lobes 4 or 5, greenish. Blooming season (in habitat): It flowers from February to April. Fruit: Red, club shaped, 2 to 2.5 cm long. Mammillaria erythra Repp. : has solitary, flattened, stem to 30 cm Ø, with pyramidal, 4-angled tubercles and shorter spines. The dull-green epidermis redden if exposed to sun light. Distribution: Veracruz (near Azumbitla) border with puebla near Acultzingo. Mammillaria erythra f. ruber Repp., n.n. : has very dark carmine flowers and characteristic epidermis that reddens in full sun. Furthermore it has a solitary growth and a larger stem to 30 cm in diameter. Distribution: Tecamayuca, Veracruz, Mexico. Mammillaria mystax Mart. : has flattened stems with neat pyramid-shape tubercle, with age can offset to form clumps. Spines are of variable length, occasionally up to 7 cm long. Distribution: highlands of southern central Mexico, centering in Puebla, Guerrero and Oaxaca. 5) Arias, S., Valverde, T. & Zavala-Hurtado, A. 2013. Mammillaria mystax. The IUCN Red List of Threatened Species. Version 2014.2. <www.iucnredlist.org>. Downloaded on 15 August 2014. 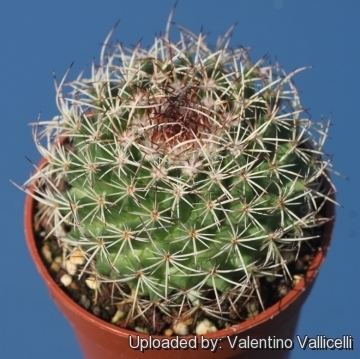 Cultivation and Propagation: Mammillaria mystax is easy to grow, requires excellent drainage provided by porous cactus soil. Exposure: Prefers bright light and ample airflow. Outside full sun or afternoon shade, inside it needs bright light, and some direct sun. Waterings: Water the soil abundantly when it is dry to the touch. Allow soil to drain thoroughly before watering again. Do not water much in the winter (Rot prone). Hardiness: Protect from frost. But it's hardy to -5°C if kept dry. Propagation: Direct sow after last frost as it usually don't braches.